Just how hot does the MacBook run? Hot enough to fry an egg? Well, not really, but a website that joked about doing just that got a lot of attention this week. For the record, the MacBook does run hot - but no hotter than comparable Windows notebooks, according to testing done by The Unofficial Apple Weblog. There are reports of the Intel 'Books randomly shutting down, Mac Observer has tips on extending battery life, and Mikegyver has begun converting Apple's MagSafe power adapters so they can be used with car power plugs. Flash memory notebook computers should dominate the market - within 6-7 years. For now, the price/capacity of hard drives still has a huge edge. We also have info on some stands for keeping your 'Book cool, reports on the 1.92 GHz G4 PowerBook upgrade from Daystar, links to several reviews, and news that LoJack software is now available for Mac users. Fry Eggs on Your MacBook? "The only qualm I've had with this notebook is heat. It gives off a large amount heat, and at one point it felt as if you could fry up a burger or two without effort. Apple's official response: 'Like all our notebooks, the MacBook meets the industry standard for case temperature.'" "Heat can be overcome with a laptop desk, or a real one; and it should be noted that even 'hot,' the MacBook kept on ticking. That's the bottom line for me: This computer took a fair amount of punishment, even a 2-foot drop, and kept on working...."
"Everyone knows that Apple's Intel powered portable lineup gets hot, but this is insane! 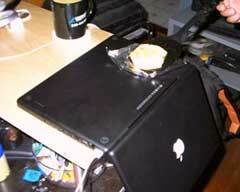 An enterprising fellow figured out that it would be possible to actually fry an egg on the bottom of his black MacBook. Granted, it probably took something like 3 times as long than if he had used a stove, but that's obviously not the point. For bonus points, keep your coffee warm by placing it on top of your MacBook power adapter." "If you didn't know yet this is a joke." "Sure it might look like a laptop, smell like a laptop, fit nicely into your lap like a laptop, but the MacBook is definitely not a duck laptop. It's also important to note that the MacBook is not a stove-top burner. "Despite these clear facts, an individual last week decided to post a how-to depicting cooking breakfast using your shiny new MacBook...."
Link: When Is a Duck Not an Apple Laptop? "We all know that MacBooks run a little hot, but do they run unusually hot? Well, Krische onLine wanted to find out so they did a fairly unscientific test. Take one MacBook and one Dell Latitude D620 and have them play a DVD. While they are playing measure the temperature and see what the data says. Both machines sport the same processor (how odd is it that the latest and greatest from Dell and Apple both have the same chip in them?) and they were both in the same environment for the test. "Although there have been complaints of the Intel-based MacBook and MacBook Pro overheating, Apple Taiwan and its distributors said they have not received any complaints from customers so far. "Internet forums for Mac enthusiasts have been discussing the problem of MacBooks overheating ever since the notebook hit the market. An earlier report from the BBC cited Apple's respond in saying that the company is 'aware of this input and is looking into it.'" "Complaints from angry MacBook and MacBook Pro users about their computers 'randomly' shutting down seem to have suddenly started flowing in by the somewhat freakish masses over the last several weeks on websites and discussion boards across the Internet, although the causes seem like they could be attributed to many different factors. "Unfortunately, there seem to be thousands of anecdotal accounts across the Internet at large about this issue, but the overall problem that everyone is experiencing is that their MacBooks and MacBook Pros are all just completely powering off during regular use without the battery having run down - most users seem to be reporting that this problem happens to them regardless of whether the computer is plugged in or not." "I just love that I can take my PowerBook anywhere and work. I just hate that the battery doesn't last forever. There are ways to extend the limited battery life all laptops exhibit, which is really great - especially since I'm sitting on a bench in Estes Park, Colorado writing today's Quick Tip. Here's some things you can do to increase your 'Book's battery life when electrical outlets aren't an option...."
"On this page you'll find information about the different types of laptop power ports found on airplanes and the adapter types you'll need to use them. "Use our Comparison Charts to identify the airlines and airplanes that offer in-seat laptop power. Select the Comparison Charts section from the left-hand menu system and choose the chart that corresponds to the class of service you'll be flying, The chart, which can be sorted by a variety of attributes, will tell you if laptop power is available at every seat or only select seats, and will also tell you the adapter type that you'll need." PR: Conversion to use MagSafe power connector with car adapter. Currently supporting MacBook Pro laptops only! $100 retainer will be refunded after the return of working unmodified Apple 85w adapter. The Car adapter supplies up to 90w of power if demanded; it is impossible to get 90w if there is only 75w available (e.g., in an airplane), but there is a tremendous amount of energy wasted converting from DC to AC, then back to DC... You've lost several wattage points just simply converting from DC to AC right off the bat. Therefore, there's a better chance that you'll see better performance with a direct DC to DC solution in an airplane as opposed to using an inverter. We are offering to convert your MacBook MagSafe power adapter so that you can use it both with a car adapter and household adapter. This conversion will cost $80 and $100 refundable retainer so that we ensure that we get back the Apple household adapter. We send you a Apple power adapter and a car adapter with a universal plug so that you can use the Apple MagSafe connector with both your Apple power adapter and car adapter. We are currently doing this for MacBook Pros only. If you do not follow these directions, I will retain the $100 and will not return your original Apple adapter. Please allow up to 2-6 weeks for delivery. It has been tested to be working with MagSafe connector to the best of our knowledge, but user assumes full responsibly whatsoever for it's use. "When the MacBook Pro and MacBook came out there was renewed interest in programs that could be controlled by titling, swinging and smacking the Mac. "The coolest ('cool' being a relative term in a tech column) is MacSaber, a program that generates the sound effects of a Star Wars light sabre based on the movement of the laptop. Gentle movements create the low hum and more sudden movements produce the electric crackle of two light sabres clashing." "Flash-based solid state drives could become the dominant storage device in laptops. "It's early days yet: the first laptop with an SSD drive, built by Samsung, launched only last month. So when will we wave goodbye to hard drives altogether? Not today, not tomorrow, but by 2013, the SSD share of the mobile computer market could reach 50 per cent." PR: In the near future, hard disk drives (HDD) may face legitimate competition in the mobile computer mass storage market as Flash-based solid state drives (SSD) stand ready in the wings, reports In-Stat. In fact, SSDs have the potential to dethrone HDD as the top laptop storage choice within 10 years, the high-tech market research firm says. The research leads In-Stat to believe that the SSD market share in mobile computers could reach 50% by 2013. The research was driven by In-Stat's survey of 389 mobile computer users, which allowed primary insight into consumers' valuation of SSD in mobile computers. From this research, In-Stat weighed the perceived benefits of SSDs with the rapidly declining cost/gigabyte trends of Flash to develop a demand sensitive forecasting model. "The HDD industry has done a phenomenal job of driving areal densities; however, it is clear that there are user segments for which drive capacities far exceed the user's need," says Frank Dickson, In-Stat analyst. "When one examines the declining cost trends for Flash, the user's need for storage and the premium that consumers place on the benefits provided by SSDs, it is easy to see that there will be a clear demand for SSDs." Given the benefits, almost two thirds of respondents to an In-Stat consumer survey are comfortable with paying extra for SSDs in mobile computers. Of all the benefits of SSDs, respondents indicate that power savings is the most important. The market inflection point begins in 2010 for In-Stat's expected forecast, as SSDs start to become an economically viable alternative to a wider base of consumers. The research, "Flash-Based SSDs in Mobile Computing: Contender or Pretender?" (#IN0603343SI), covers the worldwide market for solid state drives (SSD) in mobile computers. It includes optimistic, expected, and pessimistic forecasts for unit sales in the mobile PC market through 2010. The forecasts draw from primary data collected in April 2006 that established early adopters' attitudinal response to SSD in mobile computers and their internal valuations. It also contains an overview of the technology and a discussion of SSD's core benefits in mobile PCs. This research is part of In-Stat's PC Technology Service, which analyzes the market and technology changes that effect current and future PC system architectures. This service's coverage includes in-depth analysis of core-logic, graphics, internal interfaces, external wireless interfaces, and other changing PC technologies, as well as coverage of changing usage models, current issues in the PC market, and roadmaps for future PC processors. Link: Flash-Based SSDs in Mobile Computing: Contender or Pretender? "Does the cursor on your Mac notebook move while you're typing? Do you notice that sometimes the cursor arrow doesn't appear when you use the trackpad, or you touch the edge of the trackpad and the cursor doesn't move? "To avoid this situation, you can use the 'Ignore accidental trackpad input' option, found in the Trackpad tab of the Keyboard & Mouse pane of System Preferences." "Back in February of this year, a friend of mine bought a new 17" PowerBook G4. I advised him to wait a few more months because I knew that the Intel PowerBook was going to be released soon, but his Pismo was dying and he needed a replacement. He loaned the new 17" to me a for a few days... Anyway, the last revision G4 PowerBook was so sweet! Super zippy compared to my 1 GHz 15" G4 - and I loved the big screen and bright keyboard. I was quite envious. I ran Xbench on his 17" and saved the results so I could compare his 1.67 GHz G4 to my 1.0 GHz G4. The 17" gave a CPU score of 48 (relative to a dual processor 2.0 GHz G5) while my 15" was a 35. Clearly, something had to be done! "Daystar had a CPU upgrade for the 15" PowerBook that took the processor up to 1.92 GHz. I decided that since my most demanding programs were Creative Suite and FCP, it was best to upgrade for $500 than plop down $2.5K plus for a laptop that wouldn't be faster with my 'big' (PowerPC) apps until (Universal Binary) upgrades had been released." MacSpeedZone's Johnny AppleSpeed shows how the dual-core 1.8 GHz MacBook compares with the dual-processor Power Mac G5/1.8 GHz. "You'll find several features here that you won't find on the 15-inch model, such as a FireWire 800 connection and three USB ports (instead of two). The MacBook 17-inch doesn't have a VGA port, but you can get a dongle converter for the system's existing DVI-I port. The built-in optical drive is a DVD+R dual-layer burner, and it has double the recording speed of the 15-inch (8X versus 4X). A zippy 7,200-rpm, 100 GB hard drive provides plenty of storage space. You can also opt for a 120 GB hard drive running at 5,400 rpm at no additional cost. I recommend going with the faster hard drive, though, for the sake of performance...."
"Although they are great space-savers, notebooks can be a big bummer when you have to type or move the cursor on one, not to mention play games if you have the horsepower. We decided to give that touch pad, trackball, and even that pesky stick at the center of the keyboard a break and look into a pair of wireless notebook mice-the Logitech V450 Laser mouse and the MoGo Bluetooth mouse." "You might have wished at some point that you could fire off a few emails or check a spreadsheet one last time while you're stuck in traffic. Well, an entire company has sprung up to meet that need. 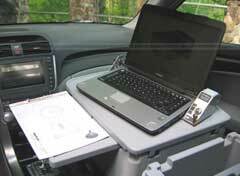 "Cargo Desk is both the name of the company the product. The product is exactly what you'd expect it to be: a desk for your laptop, mobile phone, and even file folders that you can plunk down on the passenger seat in your car. The flat surface lets your laptop sit there, open, ready for input, and also includes two mounts for other portable devices, such as cell phones or PDAs." PR: Xpad is a portable non-slip laptop pad that cools the laptop computer while protecting the user from laptop heat. It features an elegant lightweight design, thin profile, comfortable padding, and smart non-slip interfaces. 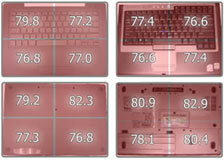 Different laptop bottoms give varying heat signatures. In general, high-performance laptops, WiFi usage, heavy processing usage, or heavy disk access usage tends to give off more heat. 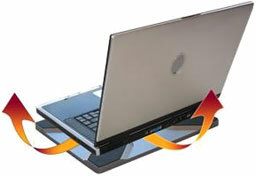 Experiments have observed laptops with temperatures exceeding 130 degrees Fahrenheit. Xpad does not use any fans to cool your Laptop. Your Laptop has been painstakingly engineered so that it can cool itself. Your Laptop cooling system is designed to inhale cool air and exhale hot air through ventilation holes using its own cooling fans. All your Laptop needs is extra breathing room so its natural airflow is not restricted - Xpad provides this extra breathing room with the X-pattern ventilation channel. A Laptop cooler with fans could create turbulence in the natural airflow that your Laptop needs and interfere with its cooling system. With the Xpad, there are no battery draining fans or extra power cords to deal with. Get the smart cooling solution that works. Get the Laptop pad that is more than just a Laptop cooler - get Xpad for Laptop. There are rubber feet on the bottom of your laptop that will sit on top of the 'X' pattern rubber pads on the Xpad. The rubber feet will provide clearance between the bottom of the laptop and the 'X' pattern rubber pads. The laptop rubber feet on 'X' pattern rubber pads create a high friction rubber-on-rubber contact to provide a non-slip interface between the Xpad and your laptop without using any awkward straps - your laptop will feel like one with the Xpad. Xpad will accommodate laptops with screen sizes up to 17 inches. The Xpad will work as long as some part of the rubber feet on the bottom of your laptop touches the 'X' pattern on top of the Xpad. Your rubber feet do not need to completely cover the 'X' pattern for the Xpad to work. Also, if you have a laptop without ventilation holes on the bottom such as an Apple PowerBook you don't need to have the rubber feet come in contact with the 'X' pattern - the Xpad will work since the laptop casing is designed as a heat sink. Keep your laptop cooler by up to 20 degrees and shield your lap by up to 40 degrees - reducing laptop heat extends laptop life and keeps your legs happy. Xpad stabilization allows you to sit in various positions without having your Laptop slip and slide - your Laptop will feel 'solid' with the Xpad! LIGHTWEIGHT: 1 lb. is about the weight of a soda can. Xpad feels amazingly light. UNIVERSAL FIT: Xpad will accommodate Laptops with screen sizes up to 17 inches. ERGONOMIC: Optimally sized to fit on your lap and to stay put on an incline without sliding. 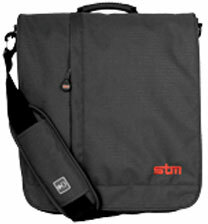 PORTABLE: Slim profile means it will fit in most Laptop bags along with your Laptop. The Xpad's innovative design shields user from laptop heat while improving laptop cooling without noisy fans or awkward straps. Its clever ABS composite structure design allows it to have a thin profile while providing an amazing structural stiffness. The Xpad is sized optimally to accommodate most laptop sizes while maintaining its portability, and yet it is large enough to sit comfortably on most users. In addition, the Xpad provides a stable laptop pad by smartly employing non-slip interfaces to comfortably secure the laptop on the user's lap and prevent it from slipping & sliding - a feature the laptop user will greatly appreciate after discovering the Xpad. PR: Precision-made Metal Stands with Finned Heat Sink & Thermal Pad designed specifically for the new 17" & 15" MacBook Pro and 13" MacBook by Power Support of Japan. 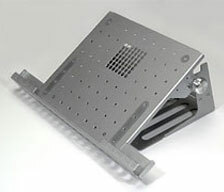 (Also fits PowerBook G4 models) Stylish, sturdy and adjustable, the new Kamas stand is adjustable to fit all three models of the new Intel-based Apple notebooks. Specially designed model for the 17" & 15" MacBook Pro and 13" MacBook. One size fits all 3 models. [Also fits all PowerBook G4s] Ledge allows CD or DVD disc to pass by. Provides level viewing of the MacBook & Pro screen while using an external keyboard. The platform is adjustable to many angles and has a space for storing the keyboard beneath the MacBook & Pro and the power supply in back. It also helps to cool them with a special built-in finned -4o heat sink & thermal pad and by keeping them up off the desktop so air circulates more freely across the their underside and dissipates heat - no noisy fans. Silver and black metal with rubber feet prevent scratches. Very solid, a professional instrument. Imported from Japan. 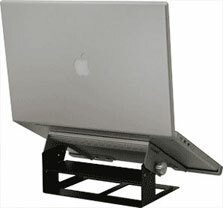 The stand holds your MacBook or MacBook Pro so the screen is at eye level when using an attached full size keyboard. Getting the notebook up off your desk also helps it to operate cooler. 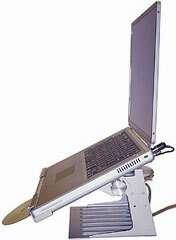 The base is adjustable to any angle and allows storage of the keyboard under the notebook. The new Kamas has an adjustable ledge that allows a CD or DVD disc to be inserted and removed while the 'Book is on the stand. As a bonus, the new Kamas has a special built-in -4o finned heat sink with thermal pad to keep your MacBook and MacBook Pro cooler. The Kamas is precision-made from heavy duty steel, a fine professional instrument imported from Japan. PR: Designed specifically for the 17", 15" (aluminum & titanium) & 12" PowerBook G4 and 12" & 14" iBook by Power Support of Japan. There is also a universal model to fit other PowerBooks and notebooks. Stylish and adjustable, the stand holds your PowerBook so the screen is at eye level when using an attached full size keyboard. Getting the PowerBook up off your desk also helps it to operate cooler. 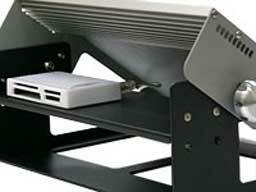 The base is adjustable to any angle and allows storage of keyboard under the PowerBook. The 17" and 15" PowerBook G4 models have a slot in the ledge to pass a CD or DVD disc through. The Kamas is precision-made from heavy duty steel, a fine professional instrument, with a silver color finish and imported from Japan. Specially designed models for the 17", 15" (aluminum - 13.75" width), 12" and 15" (Titanium - 13.5" width) PowerBook G4 and white 12" & 14" iBook. 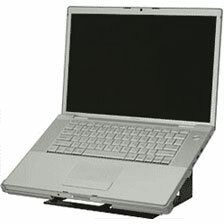 The "universal" model fits any PowerBook G3, 3400, 2400c and 1400. Slot in ledge to pass CD (some models). Provides level viewing of the PowerBook's screen while using an external keyboard. The platform is adjustable to many angles and has a space for storing the keyboard beneath the PowerBook and the power supply in back. It also helps to cool hot PowerBooks by keeping them up off the desktop so air circulates more freely across the PowerBook's underside and dissipates heat - no noisy fans. Silver color, coated steel, edge protectors and rubber feet prevent scratches. Very solid. Imported from Japan. PR: Alley - a bag that protects and conceals your notebook, without looking like a computer bag. Ample space for cables, documents, cell phone etc., but never looks bulky and cluttered. The Alley is a multifunctional shoulder bag, available in two sizes to fit most notebooks. 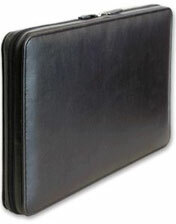 Featuring a heavily padded notebook section, which can also transport full-size video and game consoles (Large Alley). Also features a full size file section for documents, magazines and books, as well as a mesh pocket for cables, peripherals and adaptors. Pockets for cables, documents, etc. PR: maxSleeve II is an impact resistant carrying Sleeve for Apple MacBook Pro / PowerBooks models that provides maximum shock protection while carrying your computer. maxProtect II is made of synthetic leather with foam padded rigid side panels for impact resistance and shock absorption. Impact resistance foam padded side panels for shock absorption. Tight Form fitting design for MacBook Pro and MacBook Models . PR: QuickerTek has announced a new bundle for iBook and PowerBook users. Buy a QuickerTek 27dBm Transceiver for $200 to double the wireless speed and get a QuickerTek Carry Handle free while supplies last. 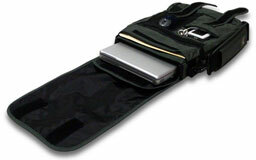 A $48 value, the Carry Handle makes using your PowerBook or iBook that much easier - especially when mobile. Carry Handles are bundled with Transceiver orders while supplies last. Orders can be placed from the Specials menu on the QuickerTek website. The removable Transceiver is easy to transport and use. A non-marring mount design keeps your PowerBook beautiful. The 27dBm (500 milliwatt) Transceiver operates on all 2.4 GHz, WiFi systems. The Transceiver supports both 802.11g and 802.11b and works with both Mac OS 9.x and OS 10.x systems. This product is designed especially for Apple's AirPort Extreme wireless systems and allows the maximum power output allowed by the FCC. For example, the Apple TiBook produces about 30 milliwatts of RF power, while the QuickerTek Transceiver pumps out 500 milliwatts. The Transceiver makes a huge difference in not only your ability to sit further away from the AirPort Base Station or access point, but also in retaining a strong and full-speed wireless signal. Your Apple laptop remains very easy to use when equipped with a Transceiver. There are no drivers or other changes to the normal wireless routine. The internal antenna and Bluetooth are unaffected - you're not required to disconnect anything to get dramatically better wireless. The antenna end of the Transceiver quickly clips onto the top of the case without Velcro and won't mar the finish or alter the case in any way. You also can connect to any popular wireless networking hardware including access points from Linksys, Belkin, D-link and of course, Apple AirPort and AirPort Extreme Base Stations. That means just about any 802.11b or 802.11g networks are within your wireless 'grasp'. PR: It always has been a missing feature: disabling the sleep mode on a Apple Laptop. Who does not want to use it as a big jukebox or go war walking. The best looking server ever, especially at about one inch height. This small utility is what you will want, this small utility acts as a wrapper to the Insomnia kernel extension. Although this small utility was originally designed as a testing ground for MultiAlarm, it is a very powerful utility for some users. PR: Absolute Software Corporation has announced the release of its Macintosh version of Computrace LoJack for Laptops, a laptop security tracking solution that locates and recovers lost or stolen computers. The new Mac version can be purchased directly through Apple retail stores, major retailers throughout North America, and directly from Absolute Software. Approximately 700,000 subscribers, including consumers, school districts, universities and colleges, corporations, and government agencies currently trust Absolute Software to securely track and manage their computing assets. John Livingston, President and CEO of Absolute Software said, "Every 53 seconds another laptop is stolen and 97% are never recovered. Losing a laptop can be expensive and distressing when you factor in the personal and sensitive data - from bank records to digital photos - that resides on it. In light of all the recent high-profile laptop thefts, consumers are once again reminded to be more vigilant than ever when it comes to protecting their mobile computing devices." Livingston continued, "Apple notebooks, in particular, have long been a target for thieves because of their sleek design, sophisticated functionality and high resale value. With the launch of our latest Computrace LoJack for Laptops product, Mac consumers - from mobile road warriors to college students - can now benefit from the most advanced computer tracking and recovery software on the market; not to mention a little peace of mind." BJ Mitchell, a computer security consultant in Columbia, Maryland said, "I was very happy when I heard that Absolute Software was releasing a new Mac version of its Computrace LoJack for Laptops product. I rely on my MacBook Pro constantly when I'm on the road to run my security consulting business. I believe Computrace LoJack for Laptops is an invaluable security tool because, as I always tell my customers, the loss of intellectual capital is far worse than the loss of the actual computer itself. My friends, family and customers rely on me to recommend products and services that I believe are essential; I cannot recommend Computrace LoJack for Laptops enough." In the event of computer theft or loss, Computrace LoJack for Laptops silently contacts Absolute's Monitoring Center when the computer connects to the Internet. The embedded software provides the stolen computer's IP address and other networking information to Absolute's Theft Recovery Team which works with local law enforcement to identify its physical location and recover the computer. If a stolen laptop is not recovered within 30 days, Absolute Software will refund the purchase of Computrace LoJack for Laptops. Computrace LoJack for Laptops is available for Mac OS X v. 10.3 or higher. The software can run on both the PowerPC-based PowerBook and Intel-based MacBook platforms. For PC users, Computrace LoJack for Laptops is available for Windows XP. The price per unit for one year of service is $49.99.